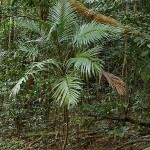 Distribution and habitat: Linospadix minor is a small tropical forest palm. It has a limited distribution in Australia’s wet tropical forests up to 1200m (3900 feet) altitude. The wettest areas would receive over 3000mm (118 inch) rainfall per year. They grow as an understorey plant and are usually found in dense shade, never receiving any direct sunlight. In some locations there would be 6-8 plants per square metre (11 square feet). Linospadix minor is the most variable species in the genus. These palms may be less an 1m (3 feet) to more than 4m (13 feet) tall, sparsely or densely clustered. Their leaves may be small to large with few to many segments. Conversely, flowers and fruit display little variation throughout the species’ range. Description: Linospadix minor is a clustering small palm with stems between 7mm and 2cm (0.3-0.8 inch) in diameter, growing from 1m to 5m (3-16 feet) high, with a crown of 7 to 12 leaves. It grows a solitary, slender, cane-like trunk with closely spaced nodes. The leaves are up to 110cm (43 inch) long, irregularly segmented with united pinnae, segments broadly adnate to the rachis or regularly pinnate with narrow pinnae. There are 3 to 24 pinnae per leaf. The pinnae are semi-glossy dark green coloured above, lighter green below, with midrib prominent on both surfaces and veins that are not prominent on lower surface. The terminal pinnae are wider at the base than any of the lateral pinnae. The leaf petiole is 4-51cm (1.5-20 inch) long with almost vertical angle. Linospadix minor produces inflorescence up to 80cm (31 inch) long. Male and female flowers may appear to be in separate spikes but both are produced in each spike and the males shed following anthesis. Petals are free in female flowers and fused in male. The fruits are small, cylindrical shaped, yellow or red when ripe containing one seed each. It is little known outside Australia and fits perfectly in small modern interiors. In a 23cm (9 inch) pot, the trunk stays just the thickness of a walking stick growing strait and tall. The 30cm (12 inch) fronds are divided into about sixteen segments with large fishtail effect at the end, almost as if the leaf had been torn across. They are held at an almost vertical angle. 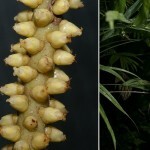 Proper care: Linospadix minor is a slow grower palm. In mild weather, half an hour outdoors in gentle rain will normally rid the fronds of the dust that settles on them. Otherwise, wash this palm under the bathroom shower or mist-spray the foliage or gentle sponge off each frond. Light: Linospadix minor prefers bright filtered light. Although this palm can tolerate poor light for periods of several months, with totally inadequate light it will inevitably make very little growth and will slowly deteriorate. It likes airy conditions and cannot tolerate drought, extreme heat or sudden changes in intensity of light. If the palm is moved outdoors during the warm season, acclimatise it gradually to breezes and bright light. Bring the palm back inside before the onset of cool weather. Temperatures: Linospadix minor will do well in normal room temperatures which would not normally rise above 25°C (77°F) . They do best if they are encouraged to have a winter rest period at about 13-14°C (55-57°F). Avoid drafts at all times. Average room humidity is fine. To improve humidity, during the active growth period stand these palms on trays of damp pebbles. Watering: Actively growing palms should be watered plentifully, enough at each watering to that some excess water runs out of the drainage holes in the bottom of the pot or tub. During the winter rest period water them only enough to keep the potting mixture barely moist. 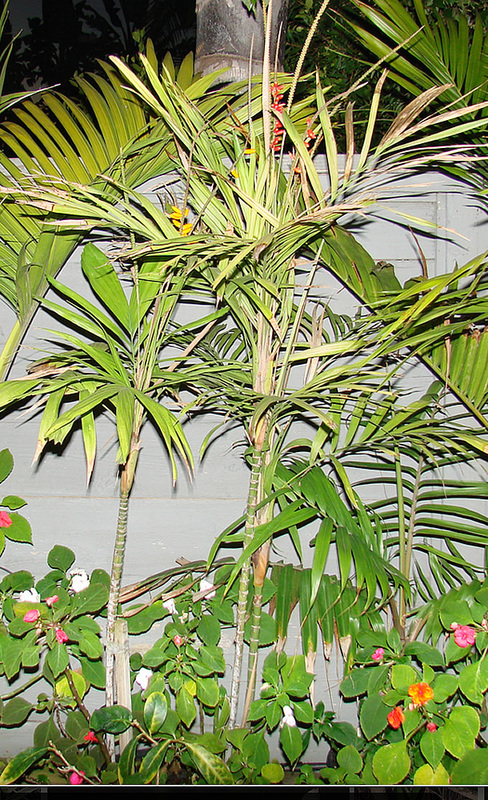 Feeding: Apply standard liquid fertiliser to actively growing palms about once every two weeks. Potting and repotting: Linospadix minor will thrive in a soil based potting mixture with some addition of peat moss or leaf mould. The drainage is essential for these palms therefore place a shallow layer of clay-pot fragments at the bottom of the pot. Once every two or three years, in the spring, move Linospadix minor palms into containers one size larger, until the maximum convenient size – probably 20-30cm (8-12 inch) – has been reached. Thereafter, top-dress the palms with fresh potting mixture every spring by replacing the top couple of centimetre (1 inch) of the potting mixture with fresh mixture. It is advisable to add a little slow-release fertiliser to this top dressing mixture. When repotting this palm, press the potting mixture firmly around the palm, taking care not to break the thick roots. Gardening: Linospadix minor is a great small palm. It is distinguished from other species by the combination of the clustering habit, elongate-cylindrical fruit, irregularly segmented pinnate leaf and long petiole. It is extremely hardy and will grow in a wide range of climatic conditions. It will do well in most gardens in warm climates. The winter minimum required temperature should be down to 2 or 3°C (36-37°F) when planted in ground, but never expose this palm to frost. It is quite drought hardy once established. Position: In cultivation Linospadix minor offers few problems, being able to stand full sunshine (but preferring half shade). In deep shade, the leaves colour is a deep green. In semi-shade they change to mid green and lose a lot of their character. Plant young Linospadix minor palms in deep shade, protected from wind. Wind turns leaf-tips brown and leaves lose their luster. Once in the ground and established, palms grow at a reasonable rate. The more shade, the larger the leaf and better appearance. Soil: Linospadix minor will thrives in rich and sandy soil that drains well. Loving a deep rich loamy soil, it also grows well in a shallow soil if sand has been mixed in freely along with compost or other organic matter to improve its drainage and quality. To plant Linospadix minor, dig a hole twice as wide as the root ball and as deep as the height of root ball. Loose the soil surrounding the roots and the dirt from the hole sides to allow easy establishment. Add water at the bottom of the hole and place the palm in centre making sure that is standing straight. Fill the hole halfway with soil and pack firmly. Fill in the hole while packing firmly around the base of the palm tree. Add about 8cm (3 inch) of organic mulch around the palm tree and water well. Linospadix minor palm will not tolerate transplanting, unless a fair care is taken. Irrigation: Water thoroughly after planting is completed. Newly planted palms like lots of water. For the first two to three weeks, water daily. Continue watering three times a week. Once established, these palms require minimal watering. During the warmer months, water palm tree approximately two to three times per week. Water approximately once a week during the winter. Fertiliser: Approximately six to eight weeks after planting – after new growth appears -, fertilise Linospadix minor with a high-quality, continual-release palm tree fertilizer. Thereafter, fertilisation schedule will be three times a year from spring to midsummer. Apply the fertiliser to the soil in a large ring at least 0.5m (2 feet) from the trunk. Propagation: Linospadix minor seed germinates within one month if fresh. The seed should be cleaned and soaked in water for one day. The germination rate is grater than 90%. Seedlings are very slow initially and very tender. They should be handled very carefully at this stage. Once seedlings reach 15-20cm (6-8 inch) high, they become more durable and the growth rate increases. 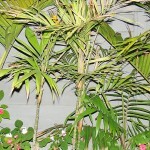 The young palms are now reasonably hardy and they love to grow up out of the pot, leaving them weak rooted and wobbly. It is recommended to use deep pots, but place seedling lower down in pot to compensate for upward movement. This avoids repotting until plant is big enough to actually use a larger pot. Constant topping up of potting mixture or repotting keeps roots strong and plants healthy. Fertilise as for most palms, although do not expect to get good growing rates. Once palms are 45cm (18 inch) high, they can be planted out. Scales insects, mealy bugs and red spider mites are the most common pests that are attracted to indoor palms. Treatment: Natural neem oil and insecticidal soaps are recommended to keep them at bay. White oil can be used for white palm scale but an insecticide is needed for the larger pink scale or black scale. Small amounts of scale can be removed by hand. Scale is not a major concern but it looks unsightly on palms. If the soil is not well drained, root rot can occur. Availability: Linospadix minor species is avoided because of the slow initial growth pattern and only specialised nurseries will handle it. These facts make Linospadix minor a collectors piece. If not fresh, seed may take 6 months to germinate in optimum conditions. Note: Linospadix minor were used for walking canes because of the toughness and strength of its cane. The dug palm had all its roots removed, generally leaving a cylindrical to slightly oval, knobby ball which, when smoothed, sanded and polished, made an excellent hand-grip. The stem was then cut to a desired length and also polished. A rubber button was fitted to the end. 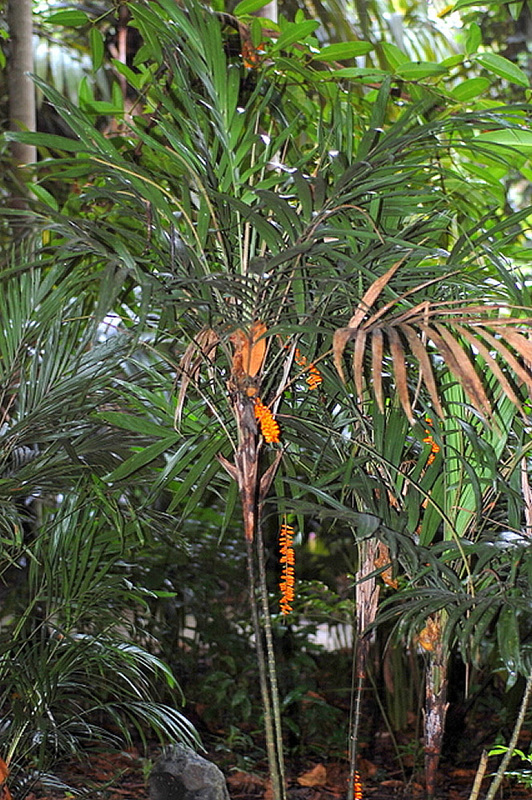 Actually, the name Bacularia did mean walking stick, while the name change to Linospadix simply means in a single spike, referring to the inflorescence of these palms. Uses and display: Linospadix minor can be used an accent plant in bush, coastal or oriental designs. Also it can be used in large planter for exotic effect. 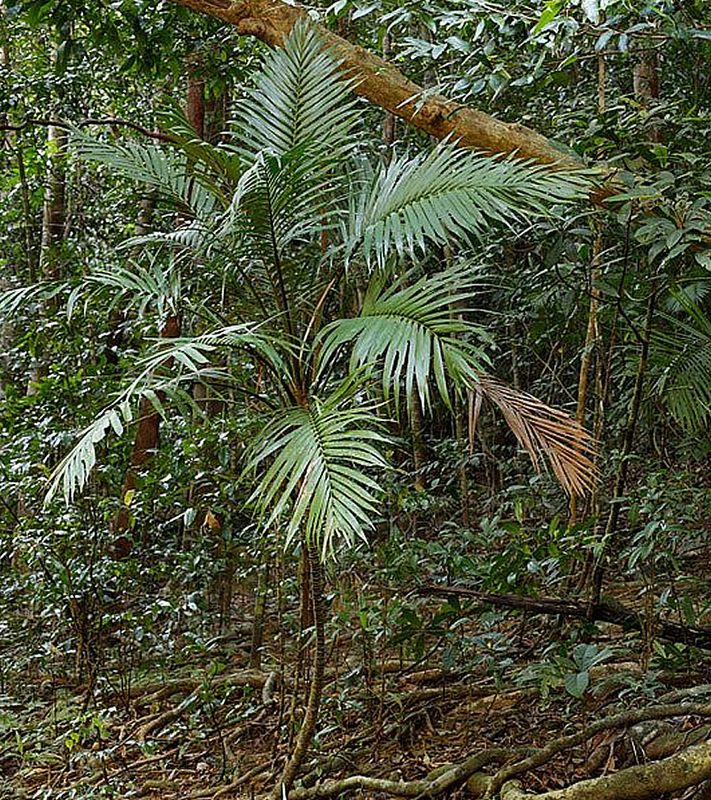 It is a relatively good palm for understory or shadier gardens. The long strings of fruit look very attractive hanging from the plant. They are attracting bird into the garden. The leaves play host to the Yellow and the Orange Palm Dart Butterfly. It can be potted and, because of its size, Linospadix minor palm is an appreciated indoor plant especially for modern small spaces.